One of the most common asked questions is regarding scarring; tattoo laser removal can be very effective for removing your unwanted tattoos and new laser technologies now leave minimal scarring. There is a lot that you can do before and after your tattoo removal session which will help with your tattoo removal process and reduce any chance of scarring. Patience; tattoo removal is likely to be a long process. Drink plenty of water; keeping your body well hydrated will help with the speed of your recovery. Supplement your well balanced diet with additional vitamins, vitamin E and Aloe both of which promote healing. Give up smoking, research shows that the success of removing a tattoo after ten treatments is reduced by 70% if you smoke. A good opportunity for you to consider giving up. Wash the treated area with a mild soap and water. Always pat the area dry with a clean towel, or paper towel, do not be tempted to rub as this may cause the scabs to come off too early causing your body to form a new scab and increasing the healing process. Apply an aftercare product regularly throughout the day. Rest, especially the day after a treatment. Avoid bumping the newly treated area. If you need to use a dressing make sure that you change it regularly, although fresh air to the treated area is highly recommended. Do not pick the scabs, you are not going to remove the ink any quicker, but will run the risk of scarring. Do not pop any blisters, not only do you run the risk of infection but this is likely to cause scarring. Keep your treated tattoo out of the sun, even weeks after treatment, the sun caused blistering quickly and will increase the healing time. Wear a sunscreen with a SPF of 30 or above. Wait at least six to eight weeks between treatments, your body will continue to remove the ink from the tattoo long after the treatment. Patience will give you better results. It is going to itch, avoid scratching the treated area, and keep the treated area hydrated with a mild moisturiser. What is R20? ‘R’ means repeat and ‘20’ means is every 20 minutes. The R20 method is a single pass of the laser every 20 minutes across the tattoo that is to be removed; up to a maximum of four passes during one session. Essentially you can therefore have four tattoo removal treatments within one session. The 20-minute waiting period is required between passes, because each pass of the laser produces very small nitrogen bubbles on top of the tattoo; which is why your tattoo will often look white during a treatment. The laser is unable to penetrate through this ‘white frost’ for approximately 20 minutes after a session, and therefore before a further session can be conducted. 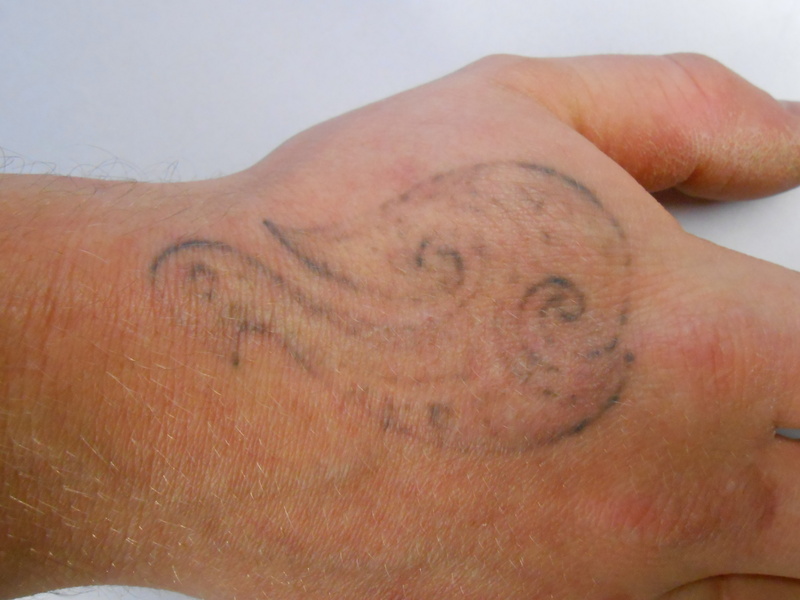 This technique is still a relatively new method of tattoo laser removal; which can, in theory, decrease the amount of sessions and overall time it could take for your tattoo to be removed. However R20 is not available for all skin types; the suitability of your skin type will be assessed during your consultation. Through our research R20 appears to remove more ink during a single sitting so it is faster, but there is no evidence to say if it removes four times as much ink. The cost for R20 is the same as it would be to have four conventional sessions. Many people find tattoo removal a painful process and will want to know if R20 hurts more than conventional tattoo removal? Reports vary from, which will be due to how each individual deals with discomfort. The R20 technique can carry a slightly increased level of discomfort during the treatment, including swelling, bleeding and or blistering. However in most cases these symptoms are only minor and should ease in 2 to 3 days after treatment and should fully resolve in 2 to 3 weeks as you would expect with conventional tattoo removal methods. To help with the R20 treatment you could consider using a local anaesthetic to reduce the amount of pain felt. Many of which can be purchased over a pharmacy counter; please ensure that your laser operator is aware that you are using an anaesthetic during treatment. As with conventional tattoo laser removal the treatment carries some risk of scarring. During clinical trials the method resulted initially with an increased level of superficial skin injury, but was found to carry no increased long term risks. There is a period of 12 weeks between treatments with this technique to allow for any healing and to give your immune system enough time to remove the ink particles. Once activated the nociceptive pain receptors send impulses through the nerve into your spinal cord where the signals make their way to the brain; telling us that we are in pain; and all this happens within a fraction of a second! So what is pain? Pain is defined by ‘The International Association for the Study of Pain’ as an “unpleasant sensory and emotional experience associated with actual or potential tissue damage, or described in terms of such damage.” This however does not explain variations of pain experienced by people; coupled with the fact that everyone also feels pain differently. Some people have a higher tolerance to pain whist others are affected by the most unassuming of things. And what was painful last time isn’t as great this time and vice versa. As humans we love the drama of a good horror stories and the more real or gory they are, the better. So when it comes to tattooing, piercing and even laser removal we have all heard the stories of people passing out and crying from the intense pain of one of these procedures. But rest assured the people who have passed out, have mainly done so because their blood sugar has dropped from not eating or they have got too worked up and their own fear causes the faint. Pain is rarely the cause. Tattoo tears are not as unusual, and that can partly be because of the discomfort especially after a long sitting and your body stressed. Sometimes tears can be due just to the emotion of getting your new tattoo; because perhaps it is a memorial or a declaration of love or other significant life event. There are some options that help to reduce pain from numbing creams to pain free ink. Speak to your tattooist about these options as pain free ink is available at Secret Ink. Freeze sprays can reduce initial piercing discomfort but should be avoided for any oral piercings. Ice or freeze spray can also help during Tattoo Removal sessions, especially at the end and can significantly reduce swelling or blistering. Take time to get to know your tattooist, piercing or laser technician; and make sure you are given the opportunity to ask as many questions as you need to. Ensure that you are fit and well before having a tattoo, piercing or a tattoo removal session. A good night’s sleep is always a bonus, along with having had a good meal recently. Consider the positioning of your tattoo or piercing, some areas on our bodies are more painful to tattoo or pierce than others. Even if you aren’t a regular coffee-drinker, caffeine apparently can actually help speed pain relief. According to WebMD, caffeine can make pain relievers 40% more effective in treating headaches, and also speeds the body’s reaction to the medications. This is why many over the counter headache medications also contain caffeine. Try to relax into the position you need to sit/lie for your Tattoo, Piercing or Tattoo Removal session. Either shut your eyes or focus on a point in the room. Try to slow down your breathing. Breathe deeply, using your chest. If you find your mind wandering or you are distracted, think and focus on a specific word. Continue with about 2 to 3 minutes of controlled breathing. Sometimes focusing on the discomfort itself, paying particular attention to the sensation. Is it burning? Is it throbbing? Is it tingling? Hot or Cold? Are there waves of sensations where the pain gets more intense and then less intense? Ask for a break, especially during a longer tattoo session; but take care not to take too long as it can feel more painful when you start again and you own endorphins slow down.